Located on the fourth tee looking down the length of the 4th Fairway of the Arnold Palmer Private Course, this beautifully upgraded 1,330 square foot, single-level PGA West Condominium offers intimate accommodations, a fresh and relaxing desert atmosphere with all of the latest conveniences and amenities. Enjoy morning coffee on a private patio with the dramatic views of the Santa Rosa Mountains (LIGHTED AT NIGHT) as the backdrop and a wonderful lake adding to the gorgeous views. Or, enjoy a barbeque in the private entry courtyard under the stars. Our spacious two-bedroom, two-bathroom retreat is drenched in sunlight and has cathedral ceilings in the living room and dining room which features a ceiling fan, and a bright, open floor plan with a 42' flat screen TV, iPod player, large sectional sofa, gas fireplace and corian wet bar. The fully-equipped kitchen features recessed lighting, granite countertops and 18 inch diagonal travertine floors that continue out onto the private courtyard entry. 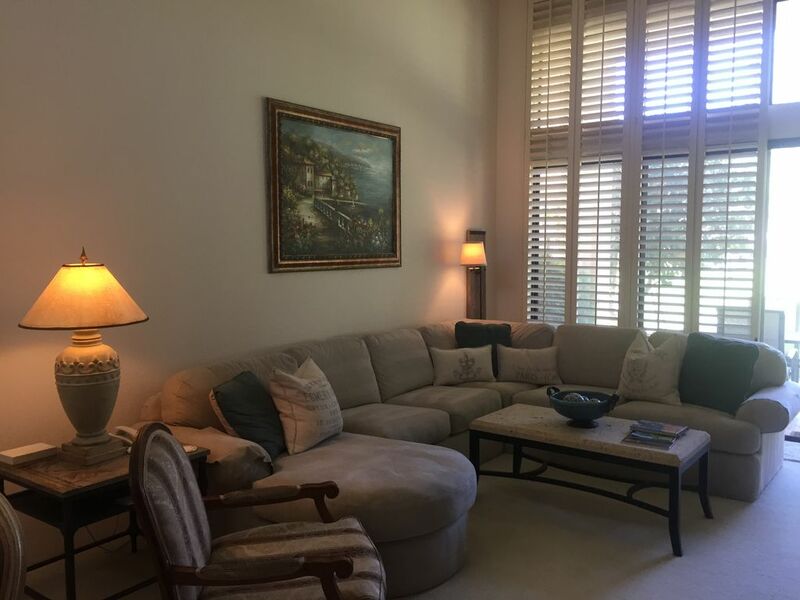 Both the living room and the luxurious master suite overlook the golf course through sliding glass doors leading to a private patio offering pristine views of the world famous Arnold Palmer private golf course and the Santa Rosa Mountains. The master suite also includes a California King bed, with elegantly appointed linens, 42' flat screen TV and a large master bathroom which features dual sinks, a large oval tub with tile surround and corian countertops. The guest suite includes a king bed with beautiful bedding, designer furnishings, flat screen TV and a full private bath with travertine floor. Each bedroom provides guests with extraordinary comfort, and ample storage. The private gated entry courtyard features an outdoor gas barbeque, sturdy cast-iron seating, and is a quiet spot to enjoy morning coffee and the newspaper. Additional amenities include air conditioning and ceiling fans in each room, indoor laundry facilities with washer and dryer, ironing board and iron, two car detached garage, bicycles and high speed internet and WiFi. This home away from home is conveniently located to all of life’s amenities and necessities. Between two sparkling swimming pools and hot spas just steps from your back door, its on one of six courses gracing the spectacular 2,200-acre PGA West resort gated community. The peaceful PGA West gated community has magnificently manicured grounds, with beautiful soaring palms, sparkling lakes, and a superb location with all the attractions of the Palm Springs desert resorts close at hand, from the Palm Springs Aerial Tramway, Joshua Tree National Monument, and Anza-Borrego Desert State Park to El Paseo boulevard (your mecca for shopping), Old Town La Quinta shopping, fine restaurants, casinos, theaters, clubs, dozens of spectacular golf courses and a variety of recreational activities. The new SilverRock Resort course and nearby tennis facilities are only minutes away. Coachella and Stagecoach festivals are just 1 mile away. Non-smoking. No Pets. This extraordinary vacation condominium is available for short and long-term rentals. After renting in the area for many years, my husband and I decided we wanted to have a place to unwind and relax year round. We purchased our condo as a second home and hope to spend more time here after we retire. We currently live in the Silicon Valley in Northern California. After traveling to the Desert regularly for business and enjoying everything the area has to offer from recreational activities, to golf and tennis tournaments, site seeing and restaurants, we increasingly enjoyed the ambiance, relaxing atmosphere and fantastic weather that the Desert brings. We loaded our condo with amenities that are important to us as world travelers, including comfortable beds/bedding in the bedrooms, a well stocked kitchen for gourmet cooking and dining, plenty of closet space, and bicycles for getting around the area and exploring. Clean, well appointed, secure townhome, with a patio looking out onto a beautiful, private golf course and mountains. Thanks so much for your review. I hope you will return! Andrea’s home was the perfect spot for myself and a friend for a weekend away. The two bedrooms had their own attached bathrooms, and the house had all the amenities we needed. Check-in was a breeze, and the owner left helpful instructions for our stay and checkout. The place was quiet and peaceful and had very close access to two of the property’s pools. Overall, we had a great stay and would recommend this to anyone visiting the area. Thanks for your review Jaime! Glad you enjoyed your stay and hope to see you again! Very well appointed and comfortable condo on the golf course. We really enjoyed our stay! Great condo in a beautiful location. This was our second year at this beautiful property in PGA West. It is comfortably furnished and was a perfect respite for four retirees from Minnesota. The patio is especially comfortable and offers a stunning view of the golf course and mountains. The owners were very responsive with a minor issue we had that needed repair. We'd highly recommend this condo to anyone looking for a great getaway! Thank you so much for your review. We are glad you enjoyed your stay at our property and hope to see you again in the future! Located 1 mile from Coachella and Stagecoach festivals. Three night minimum. 4 night minimum during January, February, April, and May. 30 night minimum for the Month of March. Special events - 5 night minimum. Seasonal Rates exclude special events and holidays. Security Deposit $1500 for Coachella and Stagecoach weeks.